The Marvel Gallery line is blasting off into outer space! The space-faring cast of Guardians of the Galaxy Vol. 2 steps off the screen and into the Marvel Gallery series as PVC statues. Gamora and Rocket Raccoon stand at the ready on a diorama base, complete with highly detailed sculpting and paint applications. Measuring approximately 9-inches tall, this Marvel Gallery Guardians of the Galaxy Vol. 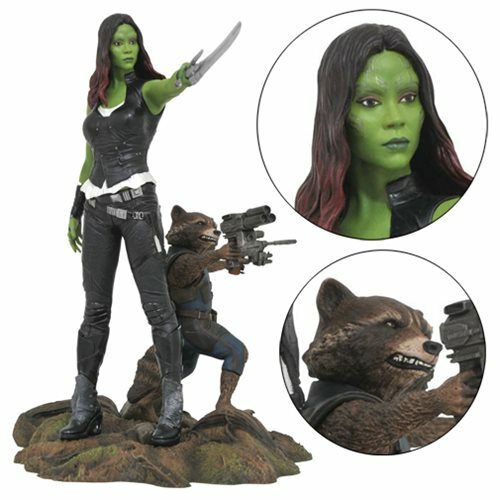 2 Gamora and Rocket Raccoon Statue comes packaged in a full-color window box. Ages 14 and up.